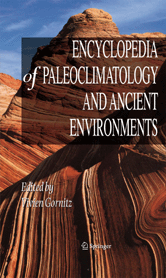 The Encyclopedia of Paleoclimatology and Ancient Environments provides the reader with an entry point to the rapidly expanding field of paleoclimatology- the study of climates of the past. The encyclopedia offers informative articles written by well known international experts on numerous subjects, ranging from classical geological evidence to the latest research. Atmospheric Evolution, Venus - Bruce Fegley Jr.
Deltaic Sediments, Climate Records - Steven L. Goodbred Jr.
Mass Extinctions: Role of Climate - Garland R. Upchurch Jr.
North Atlantic Deep Water and Climate Change - Thomas M. Marchitto Jr.